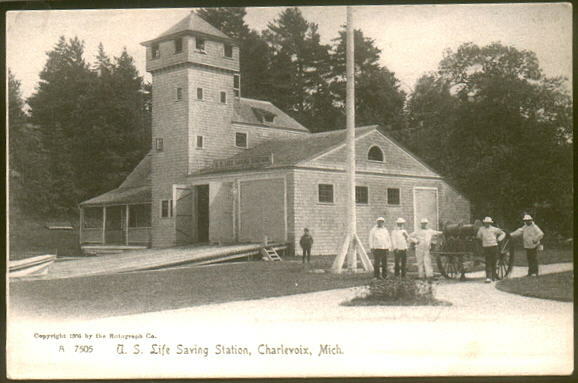 A special thanks to Coast Guard Station Charlevoix for some of the photos on this page. Turned over to the GSA in 1969. Buildings torn down except later added garage facility. Frank Fountain was appointed keeper on 12 JUN 1900 and transferred to Station Kenosha on 4 MAR 1908. Allen A. Kent was appointed keeper on 10 FEB 1908 and transferred to Station South Manitou on 24 AUG 1910. Eli E. Pugh was appointed keeper on 1 AUG 1910 and transferred to Station Ludington on 9 MAR 1913. Frank Partridge was appointed keeper on 21 FEB 1913 and was still serving in 1915. Coast Guardsman Earl Cunningham lost his life on 8 February 1936 in the performance of duties. Cunningham, a Boatswain’s Mate Second Class died while trying to save two of five fishermen marooned on an ice flow in Lake Michigan. He volunteered to take a small boat out to the flow, after Coast Guardsmen had rescued three of the fishermen earlier. He reached the flow and took the two off, but heavy wind, snow, and choppy waters prevented his boat from escaping shore. One man escaped to tell the story, but Cunningham and the other man were found four days later, frozen to death. In his memory, an apartment building on Governors Island has been named after Earl Cunningham. Original photograph from the 1940's approximately. Station with crew by beach apparatus cart from a postcard. Crew with beach apparatus cart. 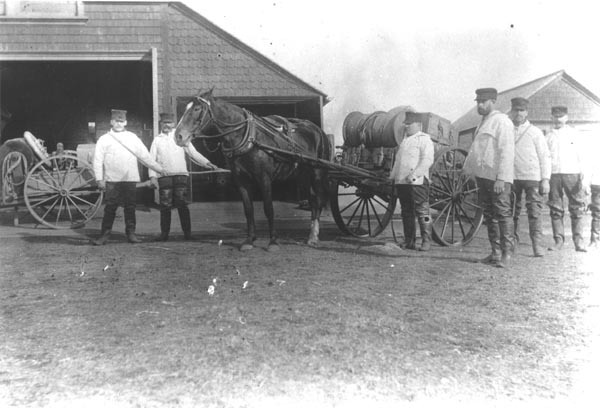 Crew with horse drawn beach apparatus cart. Many crews had to carry these by hand. The barn is in the background where the horses were kept and supplies. 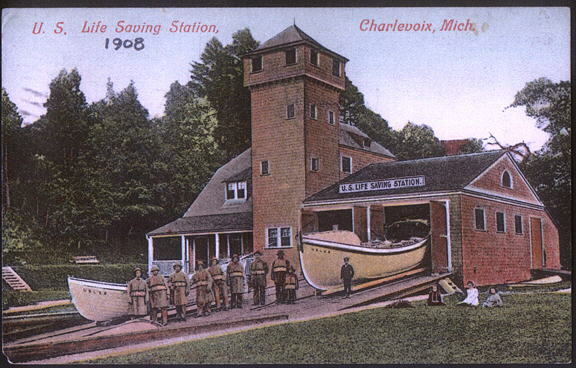 The old life saving station in later years with one of the 36 foot motor life boats on the marine railway. One of the 40 foot utility boats are docked out front and an unknown boat docked inside the marine railway. The garage to the right of the station house is the only things that remains these days of old station. 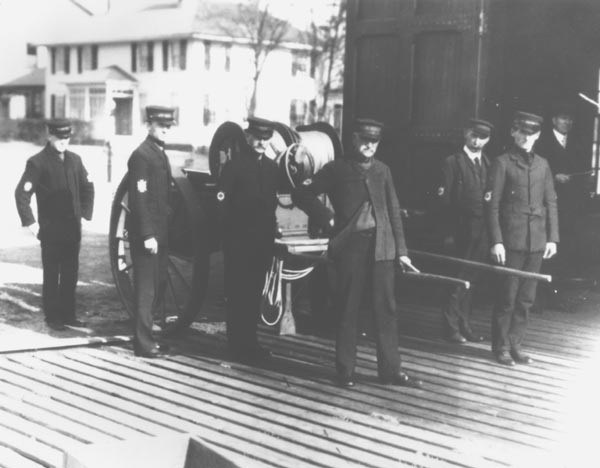 An early photo of the crew with the beach apparatus cart. Looks like the crew are wearing sweaters for the most part. The station Keeper is located at the far right hand side. 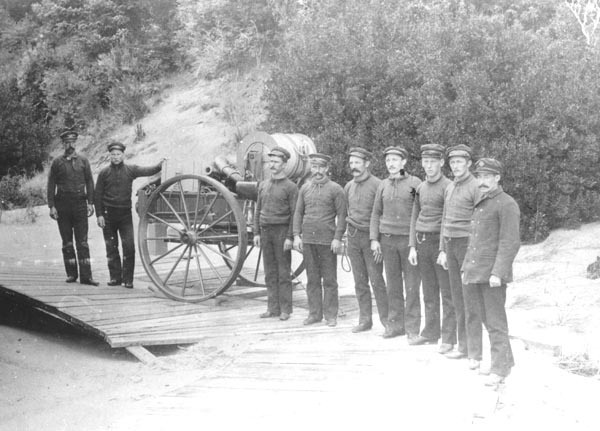 The beach apparatus cart is loaded up ready for action including the Lyle gun seen just above the cart wheel. 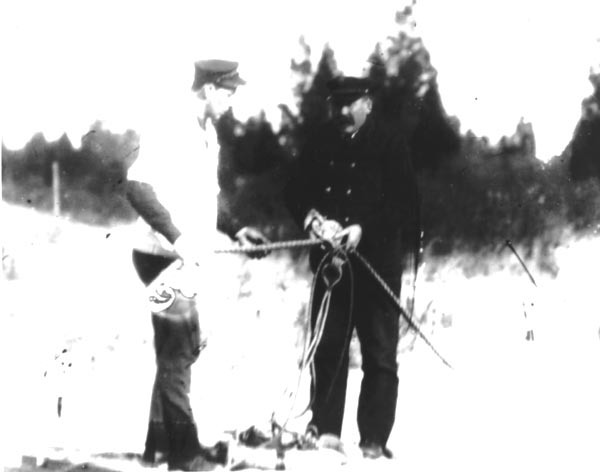 The Keeper showing a surfmen how to hook up the Hawser Cutter. This was used to cut the large breaches buoy line that carried people off a shipwreck back to shore.. 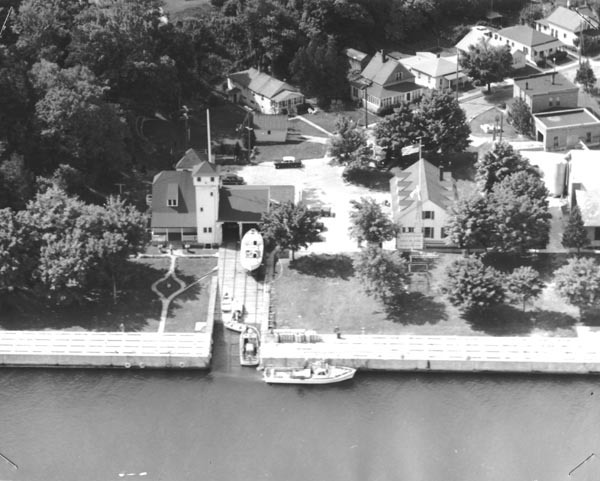 The Coast Guard years when the station was moved back into Lake Charlevoix and the new US Coast Guard Station to the left of the photo was built. 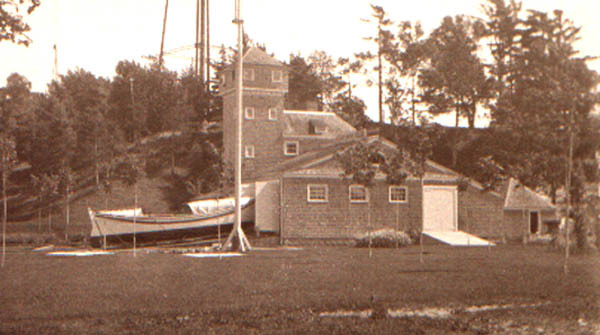 The lighthouse depot keepers house was located just below the depot building in the dirt area. It was torn down after the new station was built. The train bridge is also no longer there. 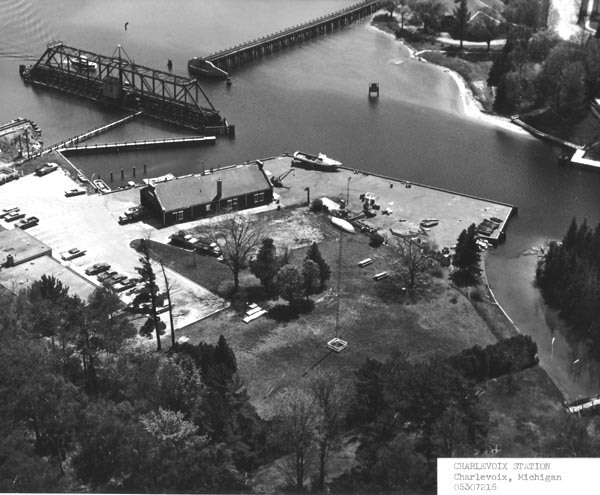 The US Coast Guard Station around 1980. 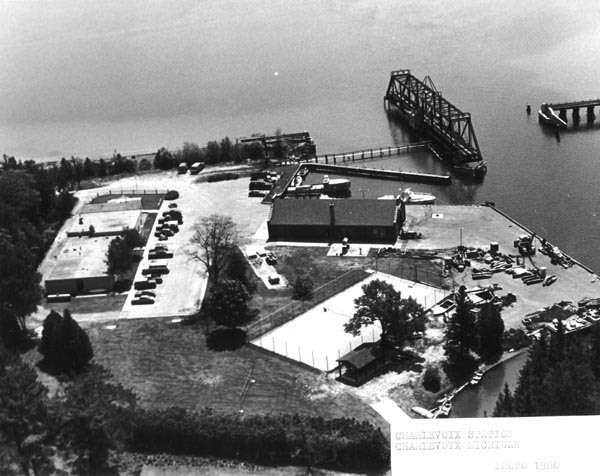 Note the new tennis court for the station below the depot garage in this photo and the Coast Guard Station on the left of the photo.